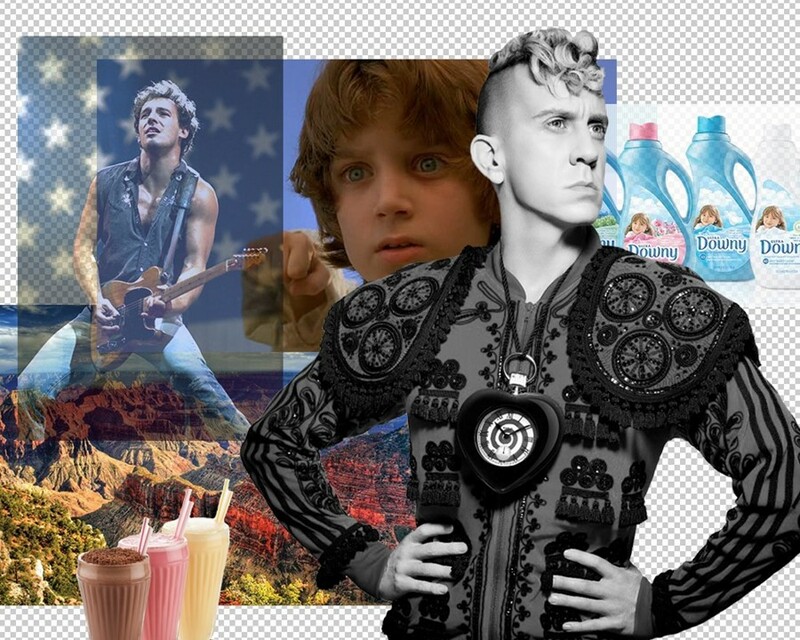 One of fashion’s last true independents, Jeremy Scott, is the American dream personified. Taking French lessons as a young fashion-obsessed farmboy in Kansas, he ended up putting on his first show in Paris at the age of 19. And he recently debuted his stunning men’s collection for Moschino, where he now works as creative director, the same company he once worked for as an intern in the late 90s. Scott’s spent nearly two decades proving truly anything is possible, entertaining and challenging high fashion and street fashion in equal measure. While his shows steal the Fashion Week spotlight, Scott also lights up the streets – whether it's his infamous Adidas Wings, his monster Longchamp bags, Mickey Mouse sunglasses for Linda Farrow, crocodile New Era snapbacks, or even his bespoke winged Smartcar. There’s always an uncompromising Jeremy Scott feel throughout all of his designs, with wild imagination and free spirited independence. The LA-based designer proudly wears his love of America on his Bart Simpson sleeve, or in the folds of Budweiser gowns (indeed, proof is all over his AW14 collection for Moschino). It felt only right to ask Scott to share a few gems from his roots. Jeremy Scott: Stars and stripes. Jeremy Scott: I might be really cheesy and just say the president. I’ll be a real brown noser and say Barack Obama and the reason why is because I feel he has been a beacon of light and hope for positivity. Jeremy Scott: Karl Rove, because I think he is evil. He’s always doing some kind of fuckery! Jeremy Scott: Well mine, of course! Duh. Jeremy Scott: "I was born in the U.S.A.!" - Bruce Springsteen. Jeremy Scott: Hmmm. I don’t know - it’s like, where was that first break really at? That’s really hard to say, that’s a concept in itself! Jeremy Scott: At home in LA – last night in the house! I’m generally pretty happy. Jeremy Scott: I was part of the new wave/alternative kids. We were definitely not the cool kids! Part of the group were troublemakers, I wasn’t. We were into music, clothes, and distaste for everyone else. I’m not actually in touch with any of them anymore. Jeremy Scott: Downy fresh laundry. Jeremy Scott: I did a road trip from New York to Miami, through the south to Kansas City. That was pretty good. I was about 22 or 25, something like that. Jeremy Scott: The sound of wind flowing through the wings of an eagle soaring through the sky. Jeremy Scott: The Chrysler building. It’s just beautiful, all the Art Deco details. Jeremy Scott: Now we’re back to Bruce Springsteen - Born In The USA! Jeremy Scott: I don’t know what you’re talking about - everything in America is great! Jeremy Scott: The Grand Canyon. Jeremy Scott: I would change the marriage equality laws. Jeremy Scott: In the underground tunnels of Disneyland. Jeremy Scott: I don’t ever really have run-ins with the cops! I’m a clean teen. Jeremy Scott: College would be free. Jeremy Scott: Huckleberry Finn. I grew up on the river too. Jeremy Scott: There will be a lot more brown eyes.